Last weekend we made a flying visit (literally) to Blenheim. 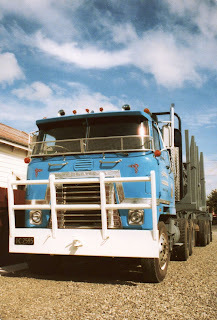 There was no opportunity for truck photos, but here is what I did snap. 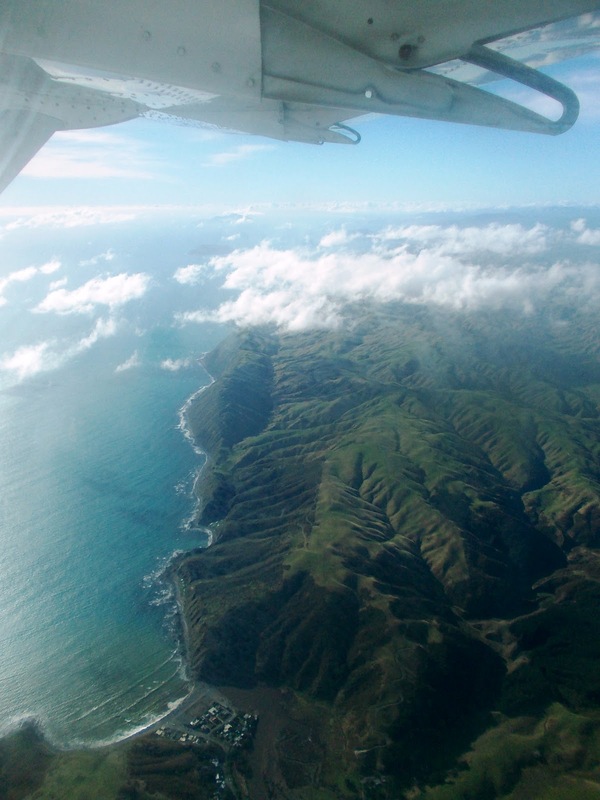 The west coast of the North Island under the wing of a Soundsair Cessna 208. Makara at the bottom of picture. 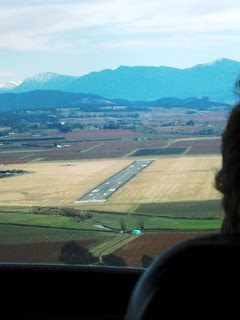 Approaching the runway at Blenheim from the east. 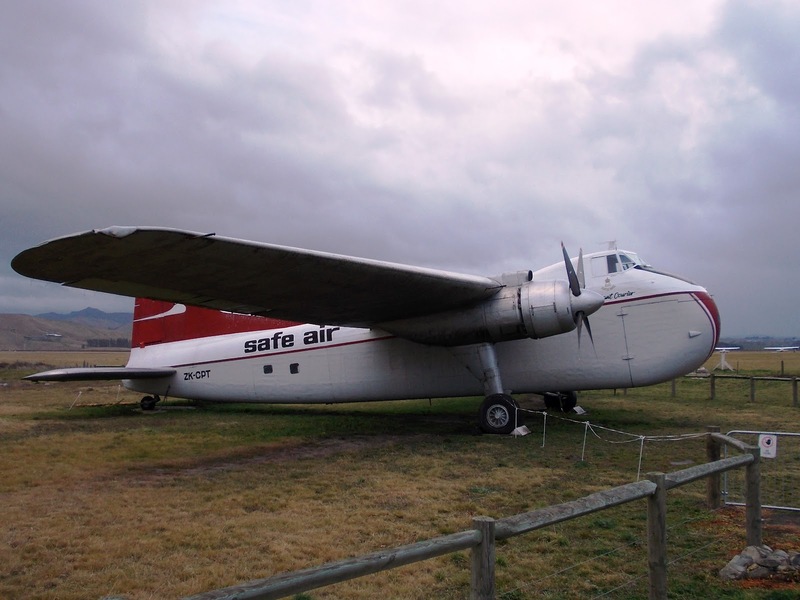 You can't visit Marlborough without visiting the Omaka Aviation Heritage Centre. 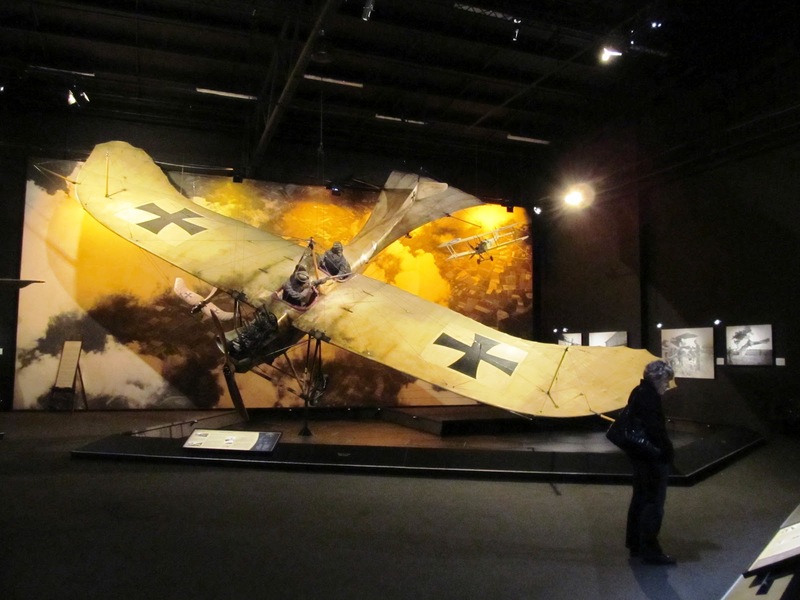 The displays are unbelievable and the photos don't do it justice. My wife appears oblivious to the dog-fight going on over her left shoulder. 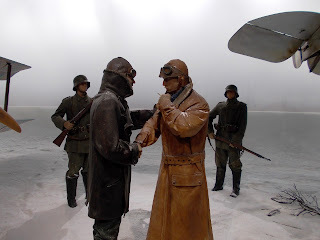 This is part of a scene depicting a German and a British pilot shaking hands after the British pilot has been shot down and has crashed in a tree. The German pilot has landed nearby in the snow. 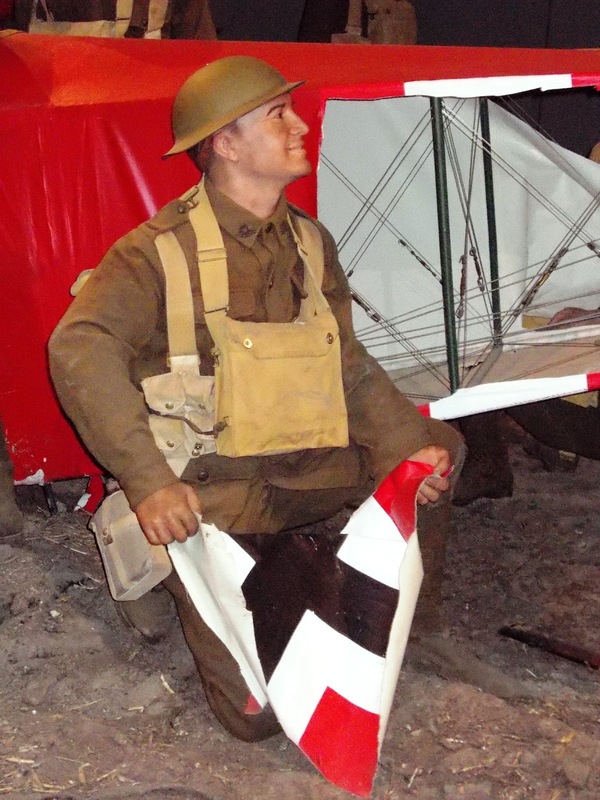 A British soldier souvenirs a swaztika from the Red Baron's Fokker Triplane which has crashed and brought the Baron to his end. 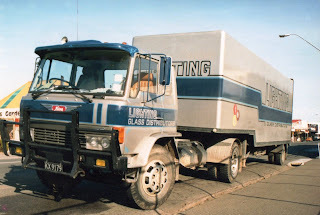 A long time since I have seen one of these. 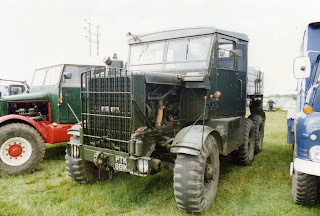 I can almost hear the Bristol Hercules radials winding up. 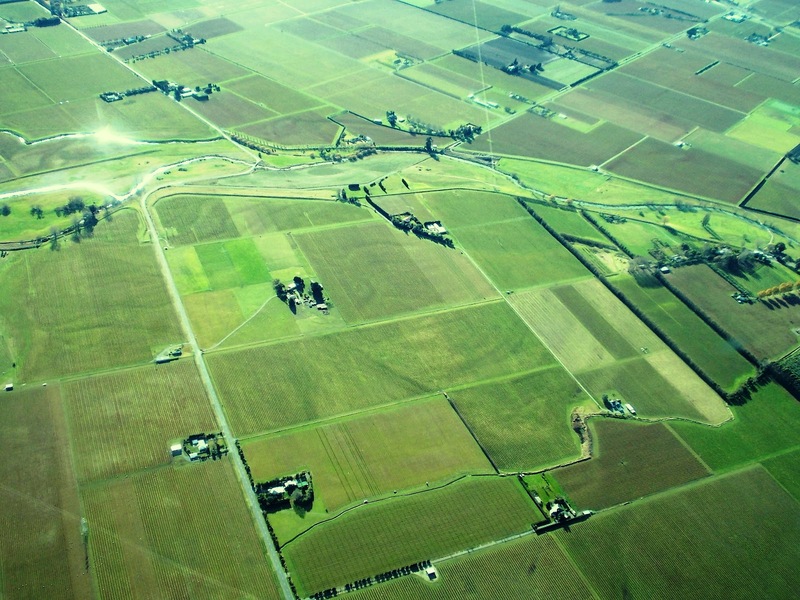 The Marlborough country-side is always pleasant. 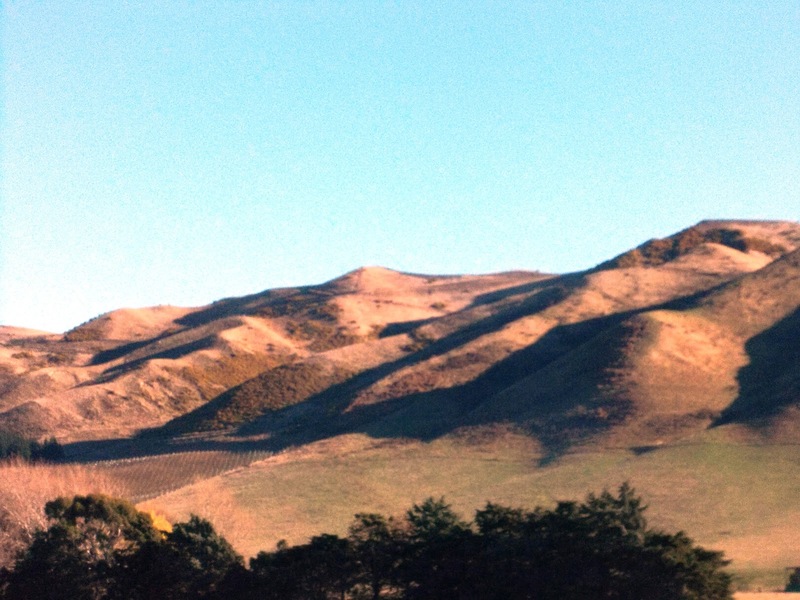 The hills south of Blenheim always look dry, even in Winter. 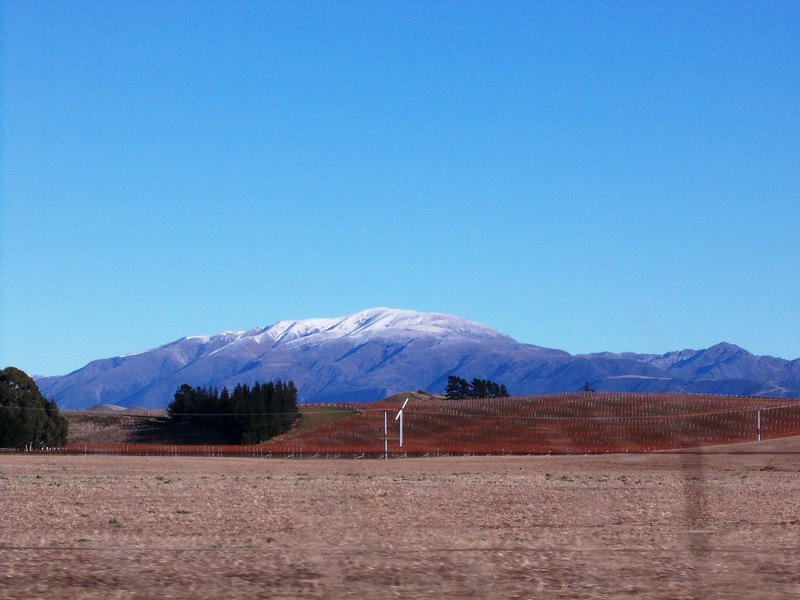 A touch of snow shot from a moving car near Ward, where we stayed. 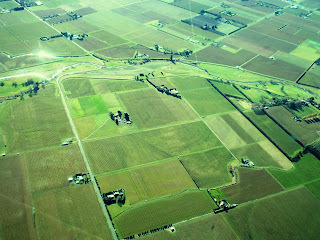 Green patchwork as we head back to Wellington. 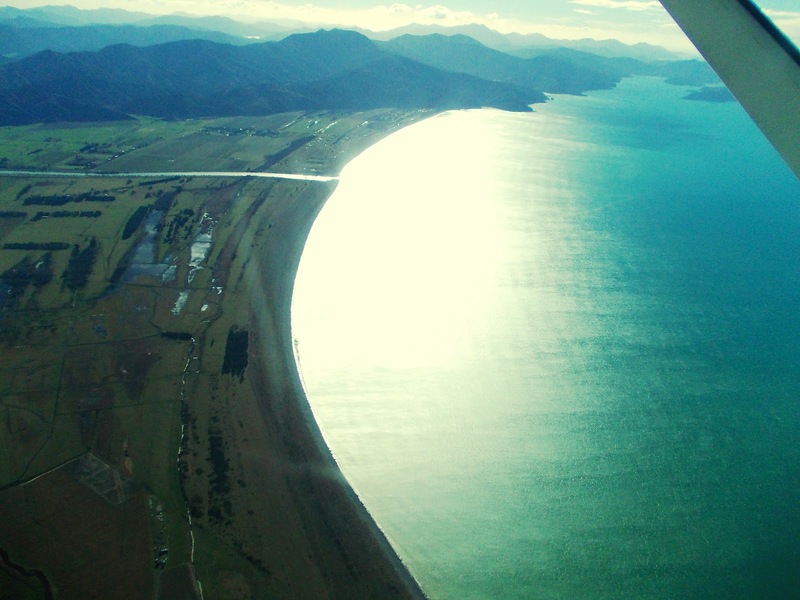 The Wairau River spills into Cloudy Bay. 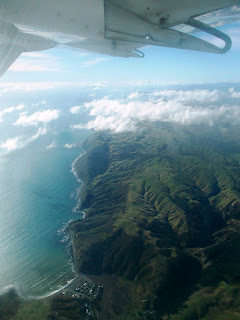 This is Wellington Airport coming in steeply from the south. 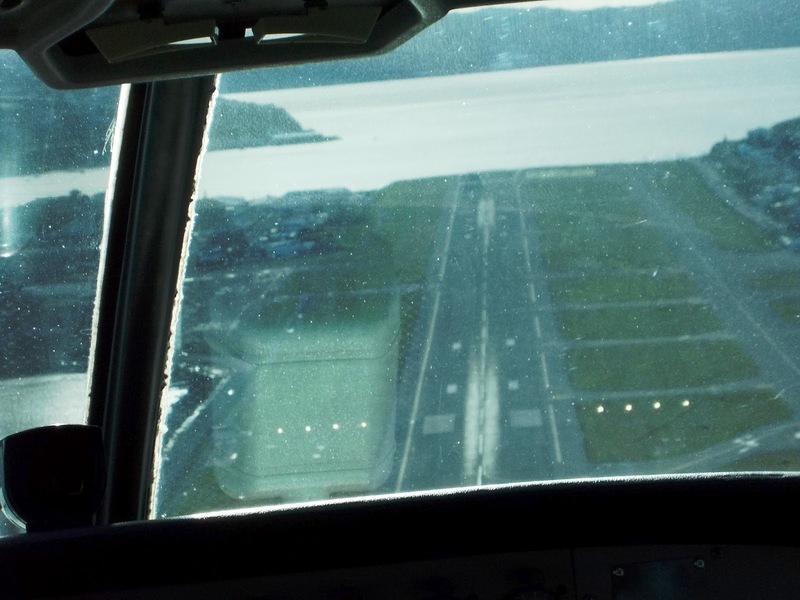 That's the centre-line of the windscreen to the left...No we are not turning, that's the amount of left rudder needed to keep us lined up in the cross wind. It appears the Werthers Original car is a Goggomobil as Old Vic suggested, but he had never seen one with a grille. 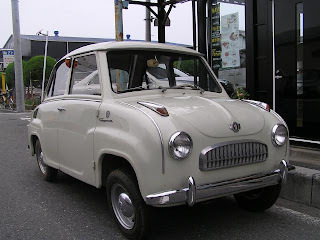 I am guessing the false grille was either an up market model or a "dress-up" accessory. The following was sent to me by Old Vic. 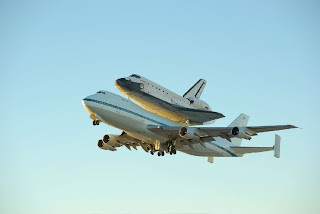 It is an account of a 747 pilot's first flight with the space shuttle attached on top. An interesting and humourous read. We took off from Columbus AFB on their 12,000 foot runway, of which I used 11,999 1/2 feet to get the wheels off the ground. 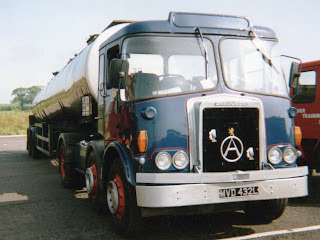 We were at 3,500 feet left to go of the runway, throttles full power, nose wheels still hugging the ground, copilot calling out decision speeds, the weight of Atlantis now screaming through my fingers clinched tightly on the controls, tires heating up to their near maximum temperature from the speed and the weight, and not yet at rotation speed, the speed at which I would be pulling on the controls to get the nose to rise. 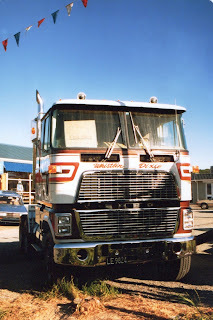 I just could not wait, and I mean I COULD NOT WAIT, and started pulling early. If I had waited until rotation speed, we would not have rotated enough to get airborne by the end of the runway. So I pulled on the controls early and started our rotation to the takeoff attitude. The wheels finally lifted off as we passed over the stripe marking the end of the runway and my next hurdle (physically) was a line of trees 1,000 feet off the departure end of Runway 16. 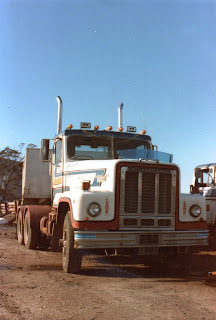 All I knew was we were flying and so I directed the gear to be retracted and the flaps to be moved from Flaps 20 to Flaps 10 as I pulled even harder on the controls. I must say, those trees were beginning to look a lot like those brushes in the drive through car washes so I pulled even harder yet! I think I saw a bird just fold its wings and fall out of a tree as if to say "Oh just take me". Okay, we cleared the trees, duh, but it was way too close for my laundry. As we started to actually climb, at only 100 feet per minute, I smelled something that reminded me of touring the Heineken Brewery in Europe ....I said "is that a skunk I smell?" 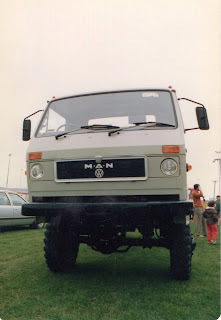 and the veterans of shuttle carrying looked at me and smiled and said "Tires"! I said "TIRES??? OURS???" They smiled and shook their heads as if to call their Captain an amateur...okay, at that point I was. The tire s were so hot you could smell them in the cockpit. My mind could not get over, from this point on, that this was something I had never experienced. Where's your mom when you REALLY need her? The flight down to Florida was an eternity. We cruised at 250 knots indicated, giving us about 315 knots of ground speed at 15,000'. The miles didn't click by like I am use to them clicking by in a fighter jet at MACH .94. 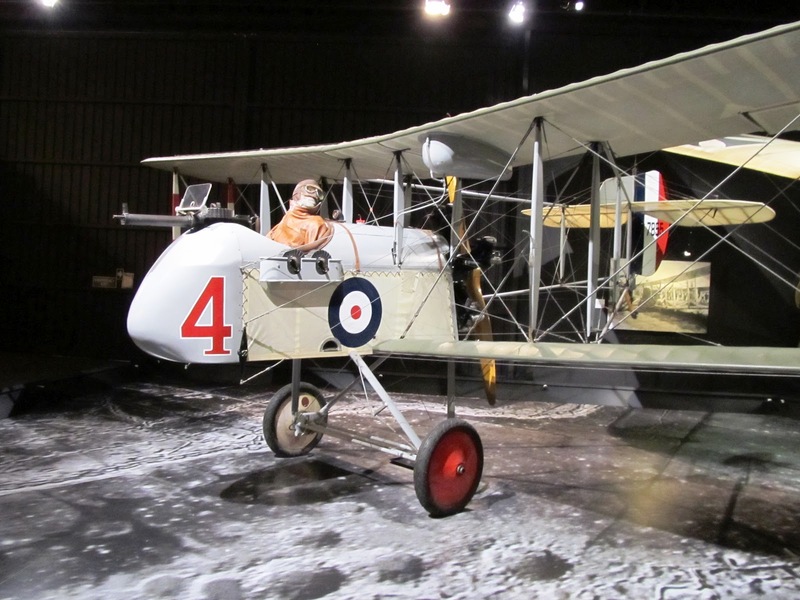 We were burning fuel at a rate of 40,000 pounds per hour or 130 pounds per mile, or one gallon every length of the fuselage. 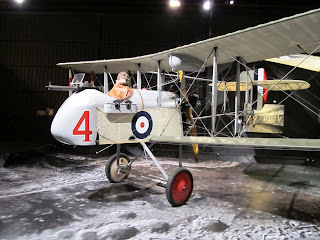 The vibration in the cockpit was mild, compared to down below and to the rear of the fuselage where it reminded me of that football game I had as a child where you turned it on and the players vibrated around the board. 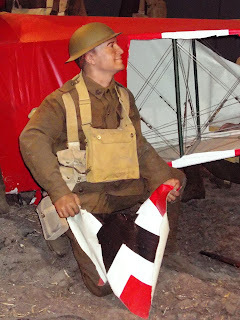 I felt like if I had plastic clips on my boots I could have vibrated to any spot in the fuselage I wanted to go without moving my legs...and the noise was deafening. The 747 flies with its nose 5 degrees up in the air to stay level, and when you bank, it feels like the shuttle is trying to say "hey, let's roll completely over on our back"..not a good thing I kept telling myself. SO I limited my bank angle to 15 degrees and even though a 180 degree course change took a full zip code to complete, it was the safe way to turn this monster. 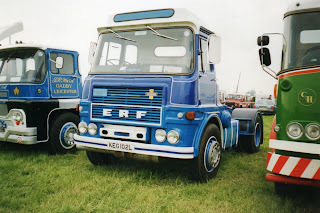 I had a comment from Old Vic in my UK Truck Photos post about the unusual ERF. 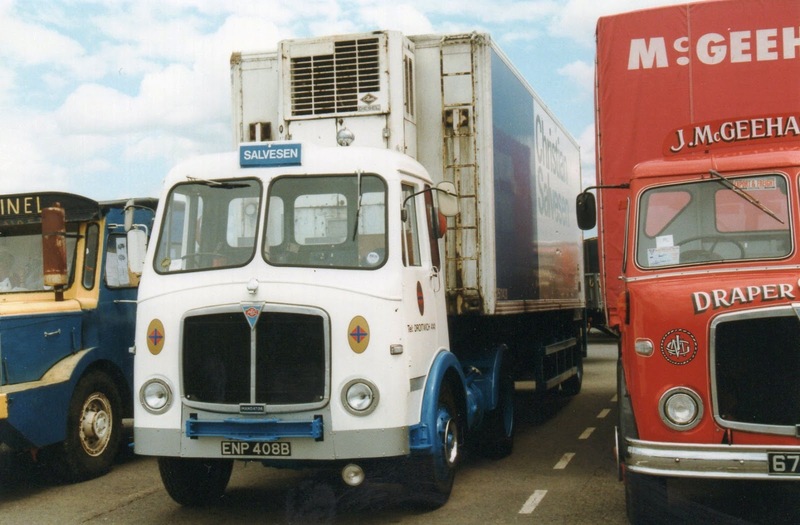 It looks to me like the earlier ERF cab that had an upright grille, but with the later KV grille fitted. 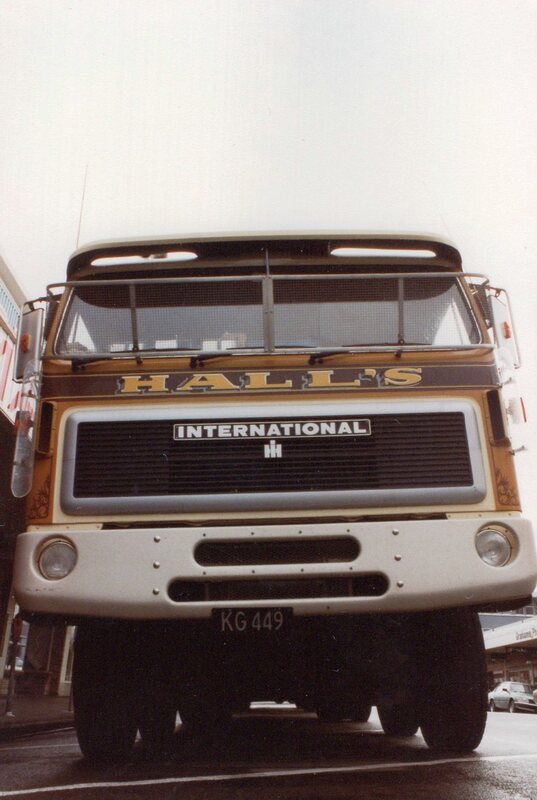 With some further investigation I found this photo in the late Pat Kennett's World Trucks No.1 book. 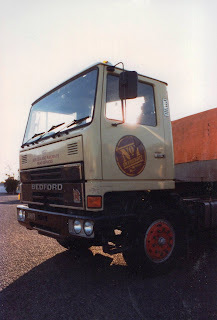 He describes it as a "hybrid" cab and comments that he thinks one has survived in the fleet of Beresford Transport. 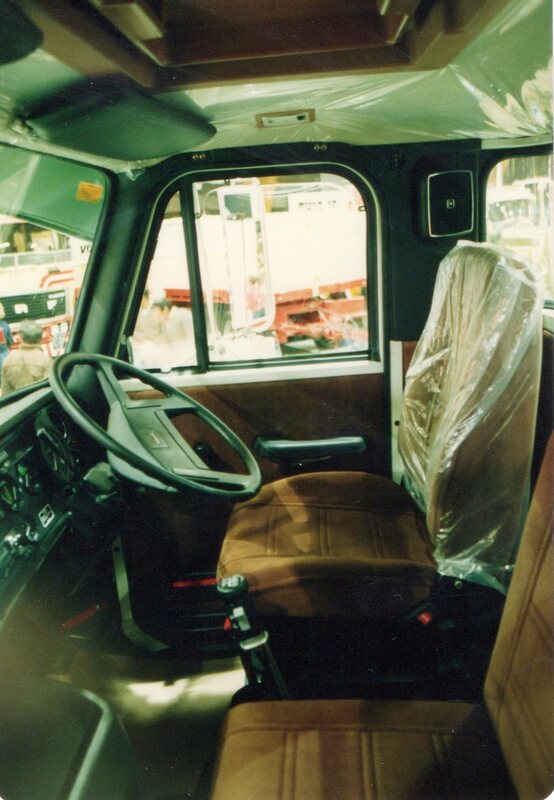 It's very similar to my picture, the only difference being the straight line to the bottom edge of the door, whereas my one has a curve over the wheel arch. 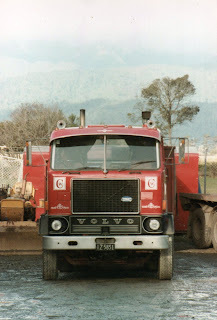 A few more older photos from various places. 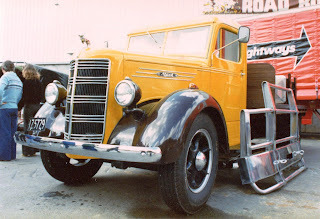 The trailers on these Car Haulaways units were mounted on a sliding 5th wheel to allow them to be slid up to the truck for unloading, as the decks on the trucks were fixed. 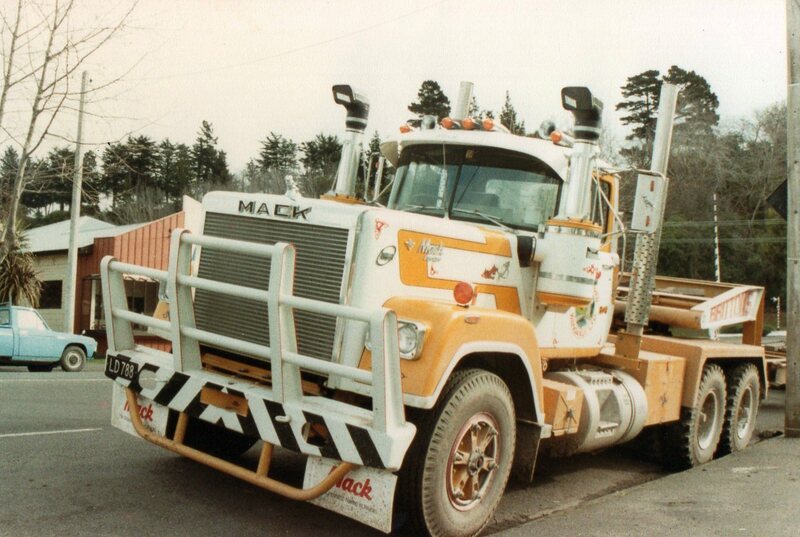 Mack MCE. 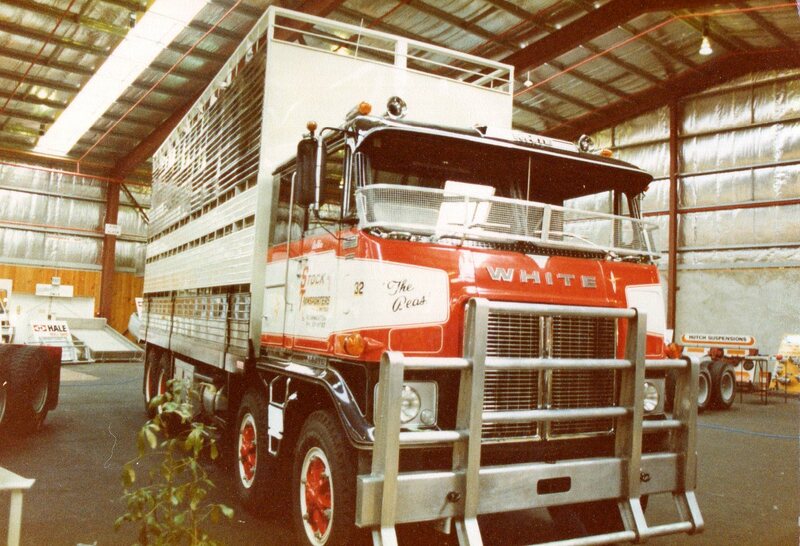 "The Beast" was a White Road Commander of Stock Transporters. I believe it was originally supplied as a day cab and then converted to a sleeper locally. 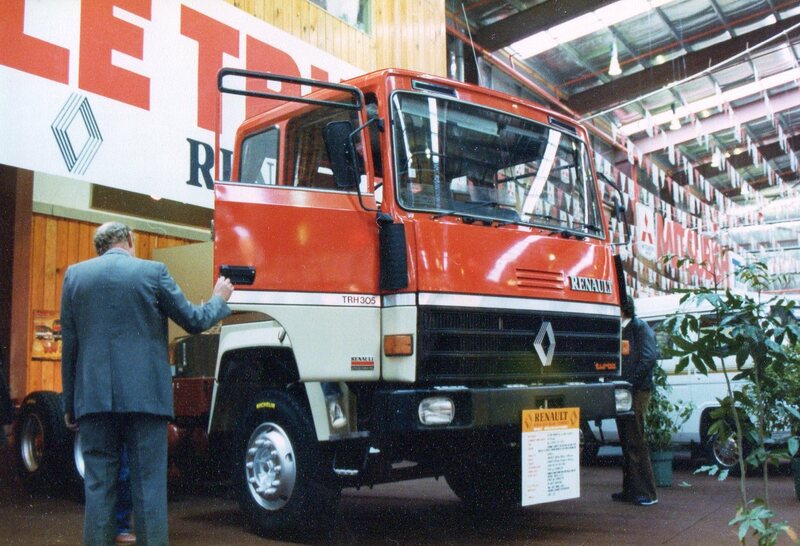 A brand new Renault makes it's New Zealand debut. 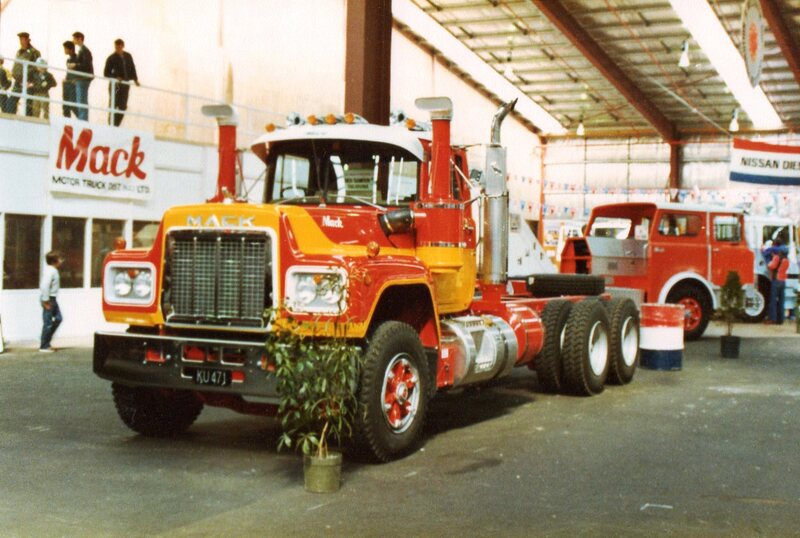 An impressive cab that was thrust on to the NZ market under the advertising slogan "Le Truck". They came and they went fairly quickly. 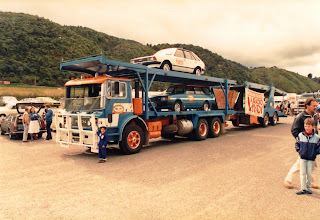 Middle-weight Japs are extremely popular in NZ. This Hino FF173 pulls a semi full of light fittings. Britton's house movers Mack R688RST from 1982. 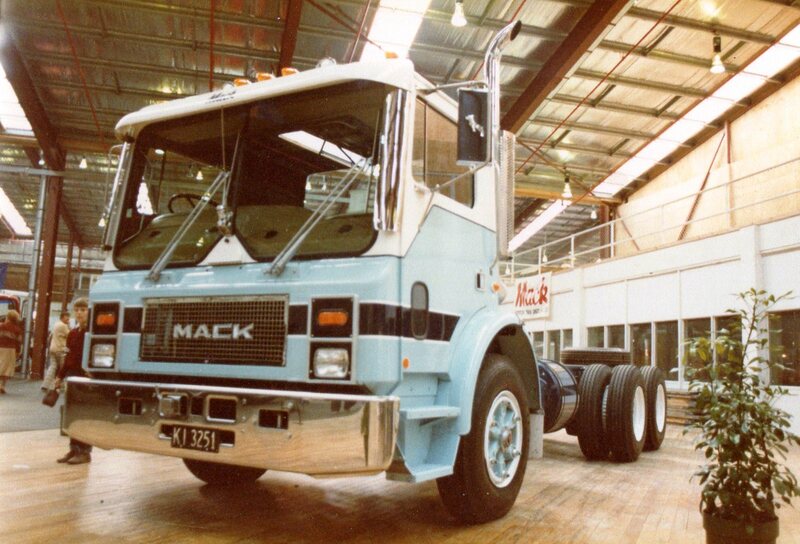 Another MCE Mack. Caltex depot in Palmerston North. This ERF was on the sales lot of used trucks at Motor Truck Distributors in Palmerston North. 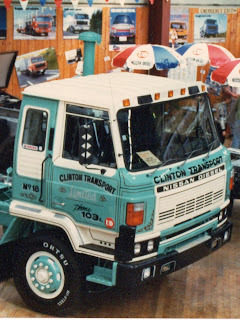 A new Nissan for Clinton Transport. 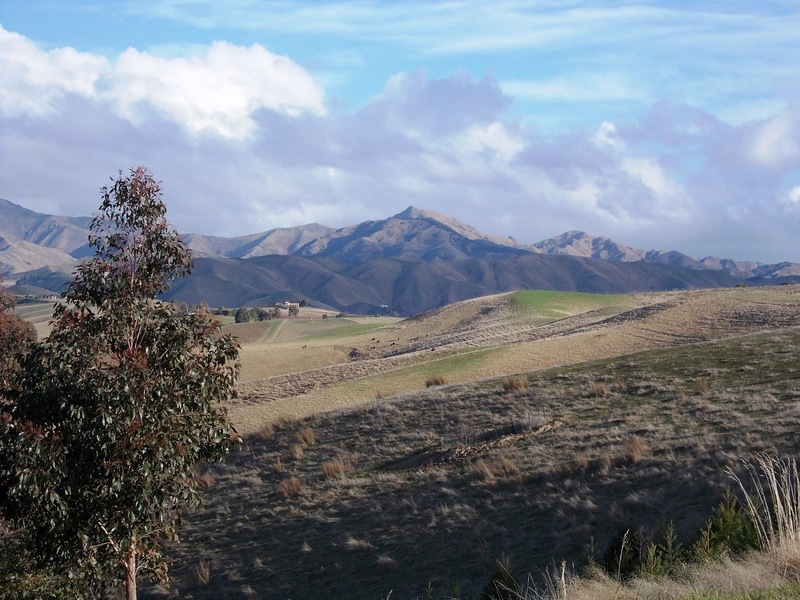 Clinton is located at the southern end of the South Island where the temperatures can plummet during winter. Some years ago I purchased a large number of photos from an ex truck enthusiast who had been swapping pix with a UK enthusiast. Therefore the following are not taken by me. This twin steer Atkinson was originally a two axle Borderer, but was converted to this configuration by John Killingbeck to meet changing axle load regulations.At the time of this photo it was owned by Kevin Dennis Transport of Skegness. Power is by Gardner driving through a David Brown transmission. 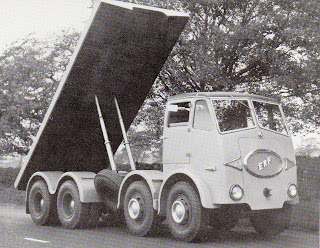 AEC Mandator in Christian Salvesen livery. 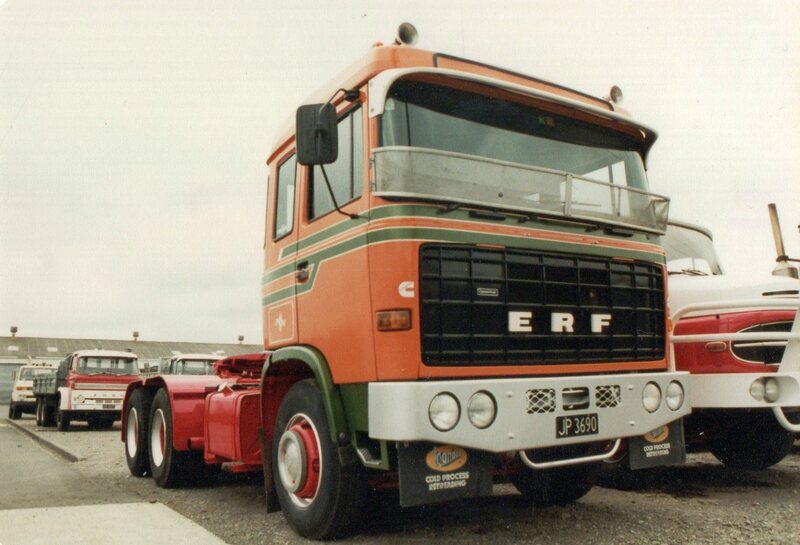 This two axle ERF KV was being used to transport fairground equipment. This model of ERF is quite unfamiliar to me. I thought only the KV (previous picture) used this style of grille. 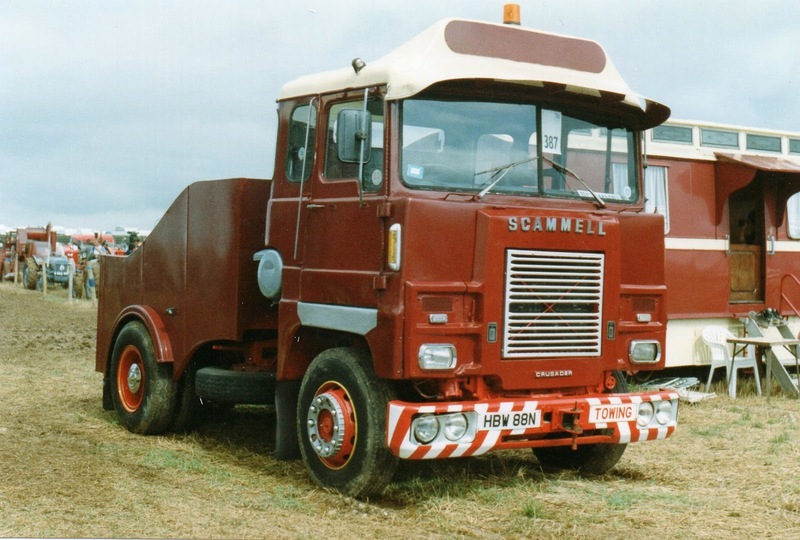 In NZ Scammell Crusaders were all tandem drive, day cabs powered by Detroit two strokes. 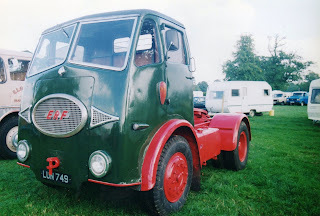 This single drive sleeper cab model is Rolls Royce powered. Scammell Explorers were used by many of the armed forces of the Commonwealth, including New Zealand. 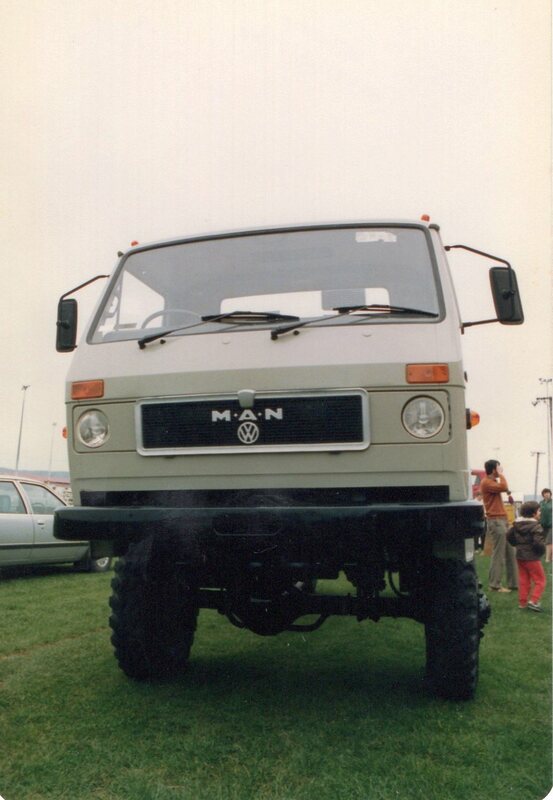 They were renowned for their incredible axle articulation. 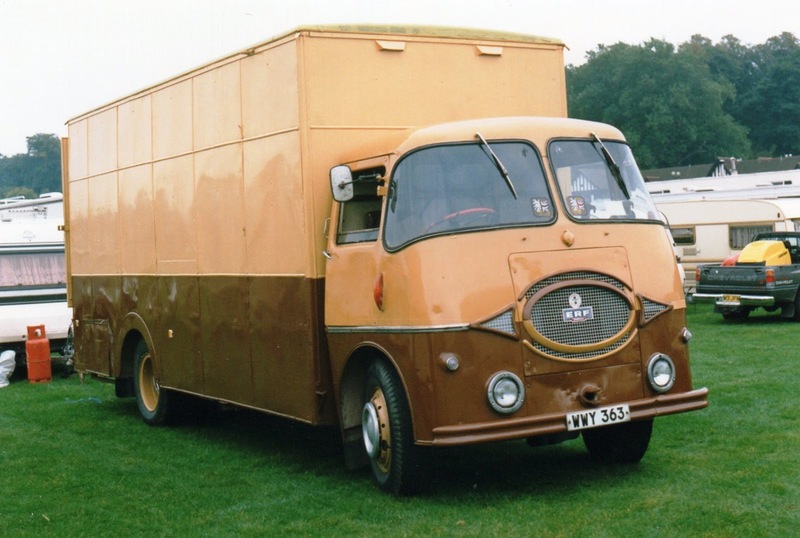 A restored AEC Mercury from 1957. 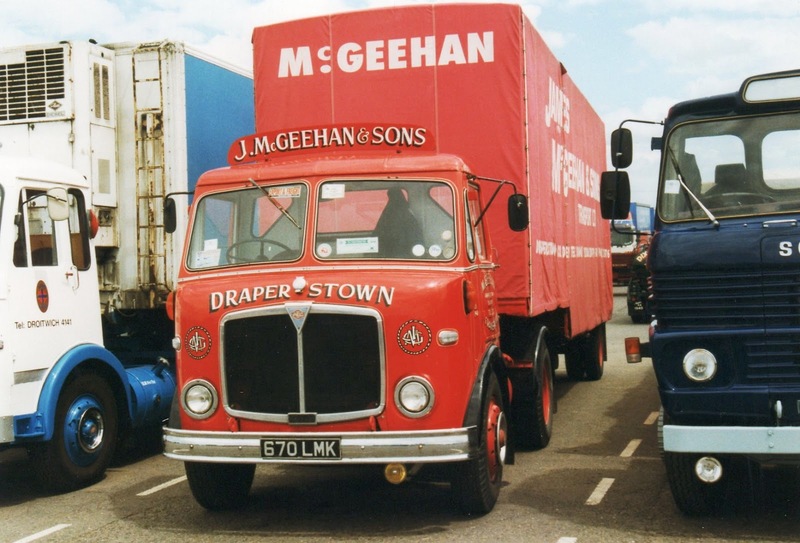 Painted in the livery of mcGeehans from County Derry in Ireland. 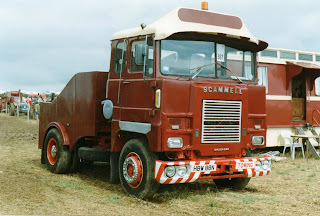 Nice old A series ERF with 220 Cummins power. Can anyone tell me what the car is at the beginning of the Werther's Original Caramels TV commercial? 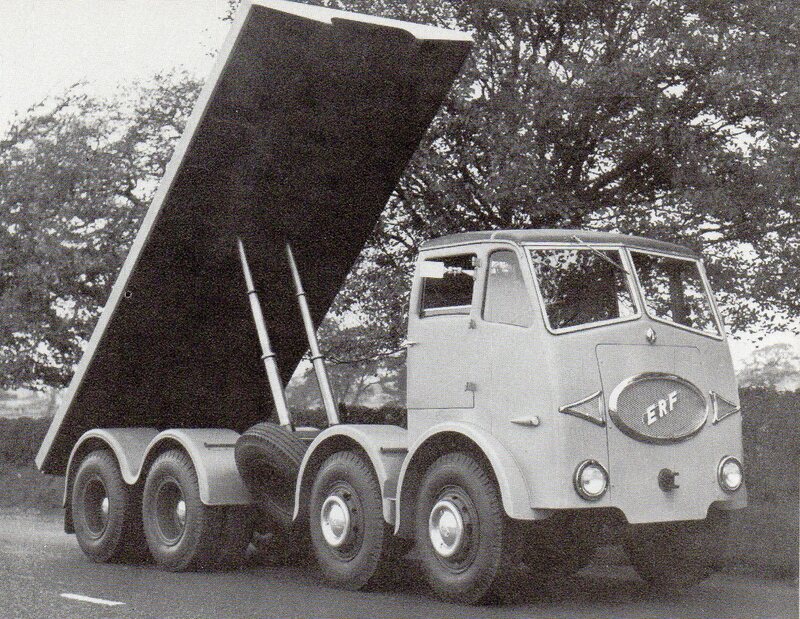 It has to be European........ 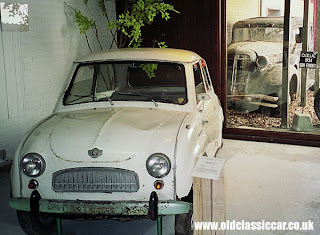 I'm thinking DKW, NSU or something like that and probably 1950s. 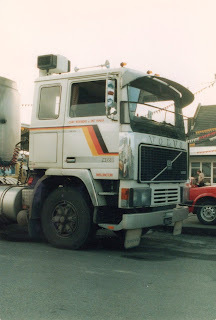 Another selection from my collection, taken mostly in the 80s. 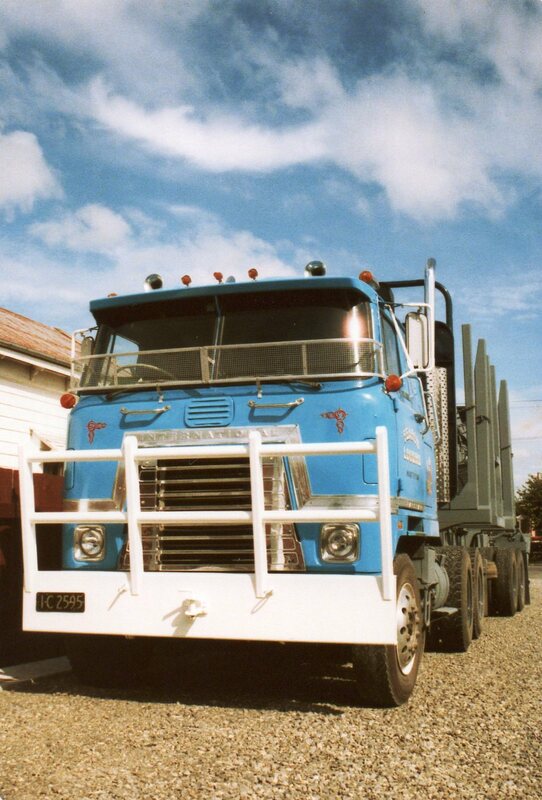 NZ Railways Road Services operated this TM Bedford from Masterton. 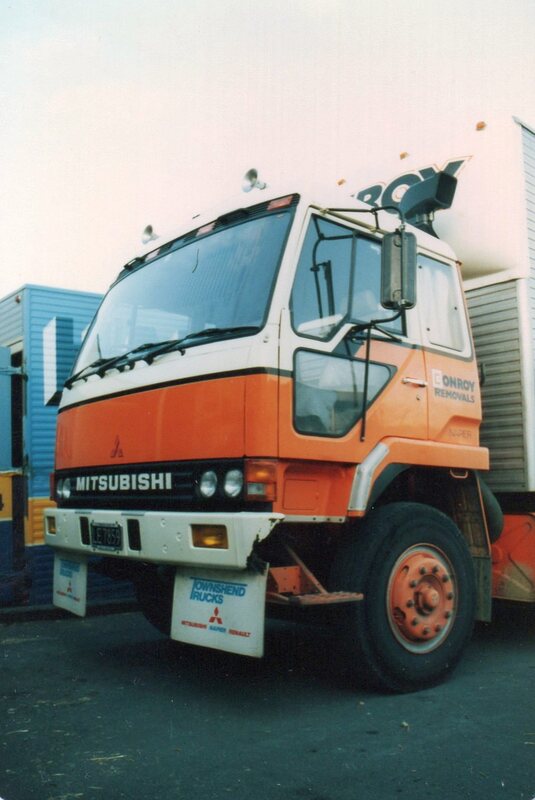 1984 Nissan 418JPRs like this one in Conroy Removals livery, had quite revolutionary styling when they first arrived on the NZ market with their curvy cab and large "extra" window in the passenger's door. Nowadays it looks almost old fashioned. 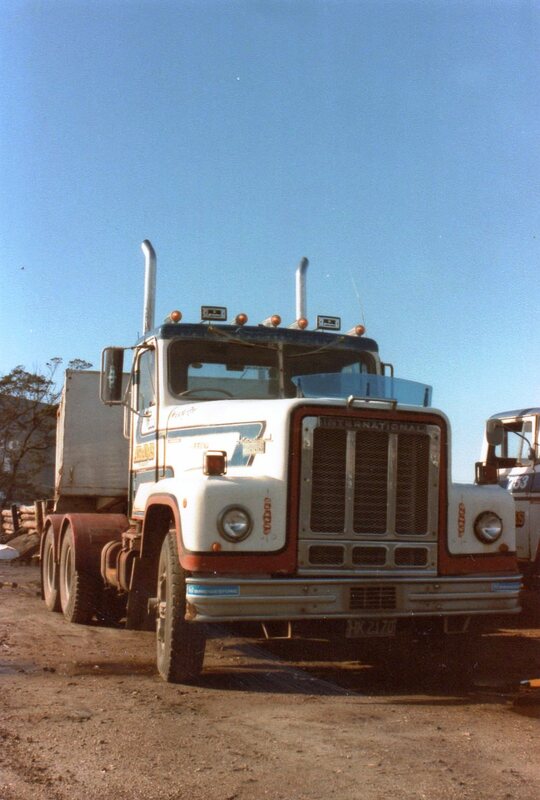 This International Transtar II is in the colours of Fearon Logging. Kevin Fearon was a fan of Detroit 2 strokes and this rig was fitted with an 8V-71. 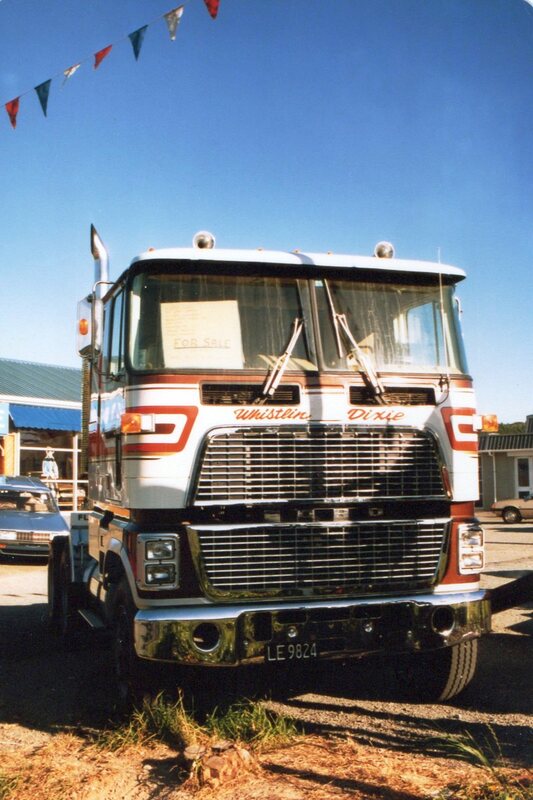 I always thought the Transtar COE was one of the best looking American COEs of this era, but I feel the white painted bull-bar ruined the effect on this example. 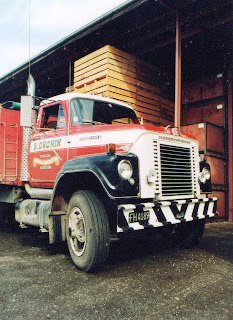 This truck was previously owned by B.Cronin and sign-written with the name "Big Jim". 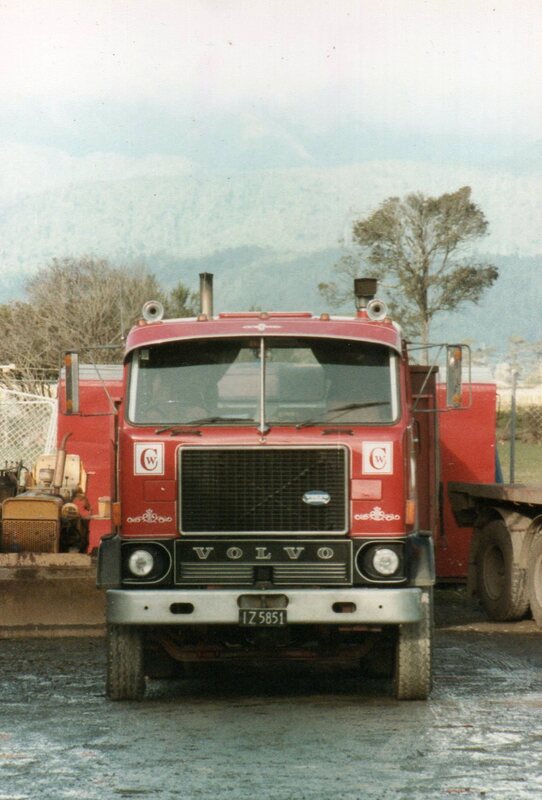 This F12 Volvo was operated by owner drivers Pat Ihaka and Clint Weinberg, carting fuel for Mobil from their Seaview depot. 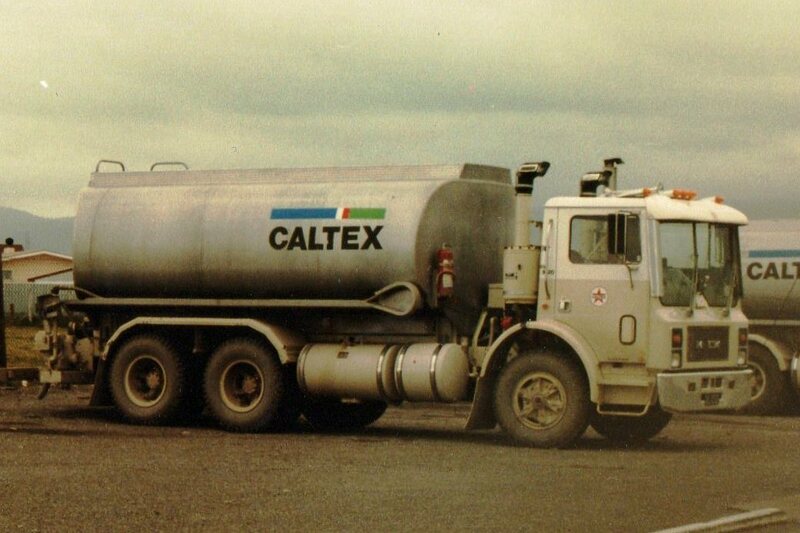 Seen here unloading fuel at at Vic's Subaru in Masterton. 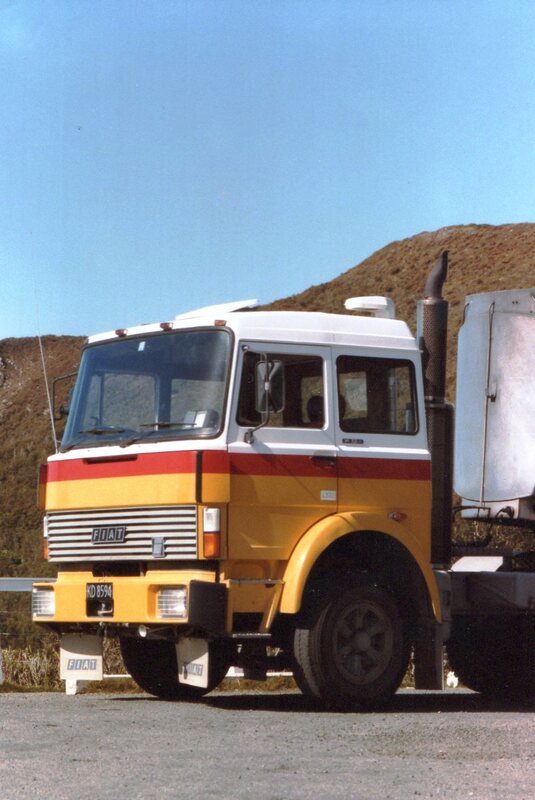 Big Fiat in Shell colours at Rimutaka summit. 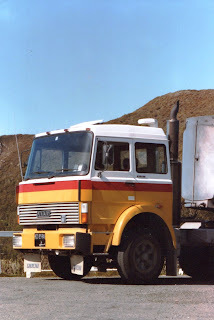 This International Transtar conventional has the name Adams on the door and, if I remember correctly, was snapped in the far north of the North Island. 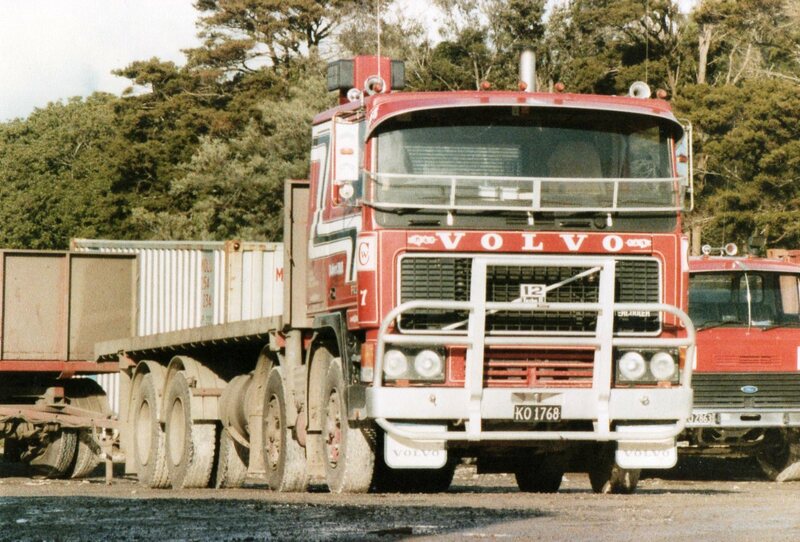 Volvo G88s were a handsome purposeful looking beast. Probably one of the last European trucks to use a divided windscreen of flat glass. 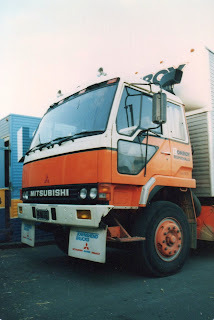 This one owned by Robert Hill Transport was seen in the Levin area. 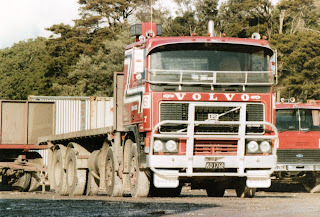 An International Fleetstar 2010 of Cronins with a load of grain at Masterton.